The safety of all students and instructors is the highest priority for the school. All students and instructors are required to wear a personal flotation device (PFD) at all times while on/near the water. Students must provide their own certified PFD. Each coach/rescue boat is equipped with a portable VHF radio. This enables instructors on the water to be in constant communication with the School and local rescue units (TOWARF and the Police). The School and all coach boats are equipped with first aid kits to treat minor medical needs. The instructors obtain daily weather reports from Environment Canada using the VHF radio. 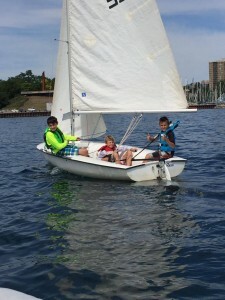 After receiving the report and reviewing local conditions, the Head Instructor decides if it is appropriate for the students to be sailing. In the event of on-water instruction being canceled, land activities are planned for the students. Land activities will include sail theory that must be learnt to achieve levels. All personal belongings are stored in the student shed in open cubicles. The Sailing School cannot ensure the safety of any valuables. Lunch is not provided by the club, however a water jug will be available for students to fill up their water bottles. Once per week, students are allowed to go out for lunch; at instructors discretion. Students, escorted by instructors, may walk to local fast food outlets, so some pocket change will be needed.